This is certainly not breaking news or a recent discovery, but I find it fascinating and, if it is new to you, hopefully you do, too. Pac-Man makes a cameo appearance in the 1982 Disney film Tron. Yes, really! Before I go any further, I will share with you the visual and video proof of the arcade game icon making a brief (and surreal) appearance on Sark’s control screen just after the light cycles escape the game grid. Tron and Ram follow Flynn off the grid and Sark commands, “Get them! Send out every game tank in the grid!” Or maybe he could have sent Pac-Man to go get them. Not only can you see Pac-Man over on the right side, but, if you listen closely, you can even hear his distinctive “waka waka” sound. What makes this even more intriguing to me is the timing especially looking back now. The Pac-Man arcade game was first released in Japan in May of 1980 and then not until October of 1980 in the U.S. The game caught on quickly, but did not reach full popularity until late-1981 into 1982. Tron was released in movie theaters in July of 1982, with principal photography completed in July of 1981 though post-production continued into Spring of 1982. Though Pac-Man Fever was certainly ramping up at that time, it was no sure thing that it was going on to become the pop culture icon it did. They could’ve easily used Space Invaders or Asteroids, but astutely chose Pac-Man to live on in surreptitiously within the film. The production of Tron marked the first time that computer animation or computer-generated imagery (CGI) had been extensively used in a feature film and is celebrated as a landmark in the industry for it. A full fifteen minutes of the film consists of moving images generated entirely by computer. Additionally, there are over two hundred scenes that utilize computer-generated backgrounds. 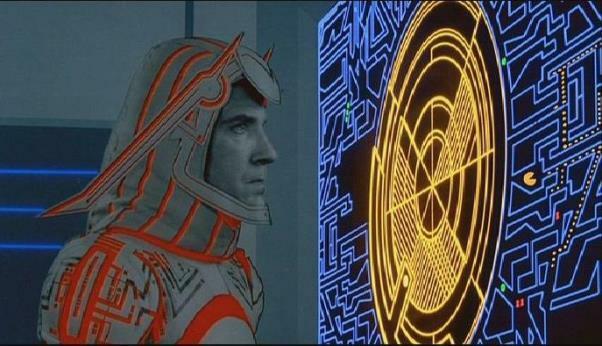 Pac-Man is not the only “Easter egg” in Tron. Since the film was made by Disney, it is not all that surprising that a hidden Mickey is also included. In the “solar sailer” sequence, you can see, for a brief moment, the silhouette of Mickey Mouse on the ground made to look like part of the terrain. When it happens in real-time it is not all that noticeable, but when paused in a still frame you can clearly see Mickey. Tron was a groundbreaking film for several reasons, but I still find a little thing like Pac-Man hiding in a scene to be pretty awesome in its own right. John Lasseter, now head of Pixar and Disney’s animation group, has described how the film helped him see the potential of computer-generated imagery in the production of animated films even stating “without Tron there would be no Toy Story” [which began development in 1991 and was released in 1995] or any of the other outstanding Pixar films since. Like I said, pretty awesome and, yep, it happened in the 80s. I feel like I've seen or heard this somewhere else before, but it is neat how they worked the most popular arcade game of the time into the film. gonna be honest, i've never even watched the original tron, despite playing kingdom hearts 2 and seeing the world of tron in that game but this is a pretty neat piece of trivia, thanks for sharing man!